The TP-Link Archer C50 is a cheap router, and as such, isn’t the fastest thing on the market. If you need an affordable router for your DSL service it’s a decent option. Just don’t try to use it with a high-speed internet connection. When most people go out to buy a wireless router, they tend to be looking for something to replace the built-in router that most broadband and DSL modems feature. And, while inexpensive routers like the TP-Link Archer C50 can get the job done, they typically don’t boost performance in a significant way, begging the question: who are they for? We tested the TP-Link Archer C50 for a week, and while its an affordable router, it might not be worth the investment, especially if you live with several people that need access to the internet at the same time. The Archer C50’s small, lightweight plastic build makes it feel kind of flimsy in the hand. But at its price point you can’t expect a heavy-duty body. Luckily, it's not an eyesore—the router is all black, with the body having a sectioned design and glossy finish. Because it’s so small, the bright green LEDs in the front are its more prominent feature. That said, it’s decent looking and you won’t feel compelled to obscure it. That’s a good thing because this is one router you don’t want to hold it back. Overall, we can’t really ask more out of a cheap router like the TP-Link Archer C50. Realizing that most of the people buying the Archer C50 likely haven’t bought routers too many times in the past, TP-Link made setup extremely easy. The instructions are printed on the side of the box, rather than in an easily-lost pamphlet. There’s a QR code printed on the side of the box, and all you’ll have to do is scan it with your smartphone, download the app it links to, and follow the on-screen instructions. We set it up in our home with Xfinity 250Mbps service, and the entire process was done within two minutes. We were then able to log into the management portal and change our SSID and password. The TP-Link Archer C50 management portal is, as you may expect, pretty barren. This router isn’t exactly bursting with features, so there’s no real need for a bunch of flashy pages. When you first log in, you’ll be able to view a network map, and you’ll have access to all the quick settings you’ll need. Clicking over to the advanced tab lets you change some more in-depth settings, though most users will never have to touch this. You can also fiddle around with parental controls and change settings for any USB devices you have attached, like a printer or external storage. There’s also support for guest networks, which we thought was surprising in such an inexpensive router—this will let you set up a secondary network for guests, so you don’t have to give out your network password or compromise your network security. You can download Tether, TP-Link’s mobile app, but it’s pretty limited. You can view you your network map, change your Wi-Fi password and enable your guest network. There is an option to diagnose your network, as well, but you can’t test speeds, like some other routers’ mobile apps. When it comes to physical ports, the TP-Link Archer C50 features 4 LAN ports and a USB 2.0 port, for external devices like hard drives or printers. That’s a pretty limited list of ports, but with such a small router, there’s not really any room for more, so it’s hard to complain. 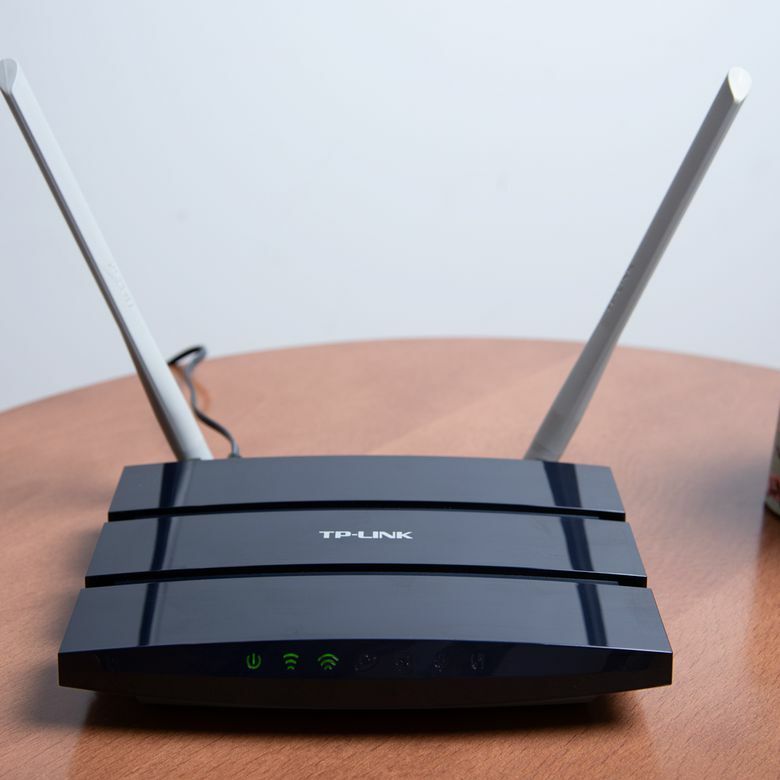 This router also features two dual-band antennas, which are rated at a speed of AC1200. This is a notably low-end spec, but it is still enough to get the job done, provided you’re not trying to push too much data through it. On paper, this is all fine for a router in this price range, but the real test is to see if it can actually live up to the 867Mbps over 5.0GHz speed TP-Link claims on its website. In our testing, the TP-Link Archer C50 just couldn’t reach its rated speeds. We already mentioned that we tested this router over a 250Mbps connection, but we couldn’t get more than 85Mbps over a wired connection. When we tested the wireless strength, we weren’t able to break past 65Mbps. At first, we thought Xfinity was having some trouble, but repeated tests throughout the day kept coming up with the same results. We were expecting the signal strength and range to be the weak point, but we were wrong. Things fall apart more if multiple devices are sucking bandwidth at the same time. While streaming some music through our HomePod, the internet speed fell to 47Mbps. When we were watching YouTube it fell even further. No matter what we did, we weren’t able to get even half of our advertised internet speeds, even with just one device connected. That sounds bad, and it’s definitely not great, but there’s a bright spot—the range. The home we tested the router in is about 2,000 square feet, with three levels, and the router located on the central level. From the moment we pulled the router out of the box, we were expecting the signal strength and range to be the weak point. We were wrong. We were able to get the same speeds throughout our entire home. Even in the basement or the upstairs bathroom, we didn’t notice any slowdowns, aside from the already slow signal. Frankly, we were surprised at how great the Archer C50’s range was. If you have broadband internet greater than 50 Mbps, this router likely isn’t worth the upgrade. But, if you’re on DSL, and especially if you don’t have a router built into your modem, you can get some pretty great range out of this router, provided you don’t have too many devices that need simultaneous access to the web. Frankly, we were surprised at how great the Archer C50’s range was. The TP-Link Archer C50’s main saving grace is the price. You can pick it up for $59.99 MSRP, though at the time of this writing it’s sitting at $39 on Amazon. That’s an extraordinarily low price for a wireless router, but you get what you pay for. Spending just an extra $10-$20 will drastically improve your experience, especially if you’re using broadband. But, again, for DSL users that need to supply their own router, the range alone is worth the 40 bucks. For just a few dollars more at the time of this writing, you can pick up the Netgear R6230 AC1200 router ($74.99 MSRP). For the most part, the specs are identical, but the Netgear R6230 has one feature that the Archer C50 is lacking: QoS, or Quality of Service. This feature will allow you to prioritize bandwidth to certain devices or applications, so you won’t have your stream interrupted by your roommate downloading a game. Neither of these devices has MU-MIMO compatibility, and that’s to be expected at this price range, but the Netgear R6230 is a much better option if you’re living with multiple people, or even if you just use multiple devices at the same time. Want to take a look at some other options? See our guide to the best wireless routers. Good for the right kind of user. When you’re going for a router in this price range, you shouldn’t expect to get high-end performance, but when it can’t even deliver the advertised speeds on a broadband connection it’s a problem. However, if you don’t have a broadband connection, and you won’t be bottlenecked by the router’s limitations, the long range is enough to warrant a recommendation. Just don’t expect to do much in the way of multi-device streaming, it’s just not built for that. Product Dimensions 9.1 x 5.7 x 1.5 in.